For the past two years, the U.S. Left has gone through a dramatic change in size, composition, and confidence. “The Rebirth of Social Democracy in the U.S.” was my first attempt to outline of some of these changes. 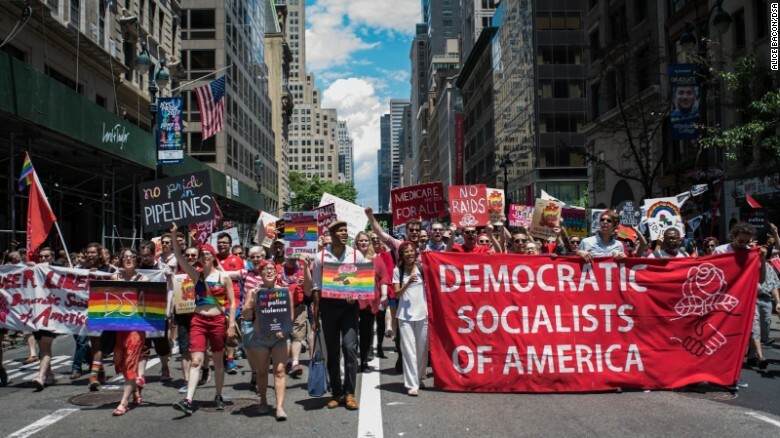 The major thrust of my article was that the explosive growth of Democratic Socialists of America (DSA) was not only an important indicator of new, burgeoning interest in socialist politics but it could possibly be the embryo of a new socialist party in the United States. It is an explicitly socialist, anti-capitalist organization at the beginning phase of a period of radicalization, not at the end, like in the 1960s and 1970s. Since the publication of my article in April, the upsurge in teacher strikes in the so-called “Red States” has transformed the terrain of socialist politics. While the recent biannual Labor Notes conference made it clear that there’s a new generation of young radicals heading into the workplace. The left is in transition from being a collection of small groups—surrounded in a political milieu dominated by a larger middle-class liberalism — to potentially building a socialist movement with roots in the working class — something that hasn’t existed since the 1940s in United States. Yet, much remains in the way of achieving this. The teachers’ strike wave began in West Virginia and spread to Oklahoma, Kentucky, Arizona, and Colorado impacting other teachers struggles in many other states. I don’t think anyone on the U.S. Left will dispute that the springtime strike was the most important strike wave in forty years. The teacher strikes have had a spill-over effect into other industries such as the hospitability in Las Vegas, communication workers at AT&T and, the largest private-sector unionized employer in the United States, UPS. It transformed what was looking like a gloomy year for us with the coming decision on the Janus case by the Supreme Court into a new optimism. Many of the striking teachers are women, undoubtedly politicized by the misogyny of the Trump regime, the #metoo movement, Women’s Marches in 2017 and 2018, and the mass killings in their workplaces across the country. The eventual settlement of the teacher strikes varied from state to state but it is important to recognize that these are political strikes. If we define political strikes as withdrawing labour from the work process for political demands that are considered outside the ‘normal’ framework of ‘collective bargaining,’ then it is quite extraordinary the number of political strikes that have rocked the country during the spring time. Race is not an add-on to the struggle for wages. It shapes the terrain of struggle. In all these states of teachers’ revolt—Arizona, Oklahoma, and Kentucky — an increase in the concentration of students of color is associated with a decrease in dollars spent per pupil. Many of the big, strategic lessons from the teachers’ strikes aren’t widely or universally accepted on the Left, or even among socialists. One is that the working class is still the most powerful social agent for progressive, radical change. It’s sometimes hard even for Marxists to believe this because many of us haven’t seen it demonstrated in our lifetimes. But now we’re seeing it in practice, and it should give us a lot of confidence about our strategy and our political priorities. In 1969, over 60,000 miners — more than one-third of the mining workforce — participated in wildcat strikes, demanding safer working conditions and protections from black lung, a deadly (and completely preventable) respiratory disease that comes from inhaling coal dust. That year, 70,000 miners marched on the West Virginia capital to demand black lung legislation. The miners won their demands. The West Virginia government was always under the control of the Coal bosses and Black Lung legislation languished until the miners took strike action. In 1970, Carey led an unlikely political strike after Republican Richard Nixon tried to whip up public support for his policies in Vietnam by asking his ‘silent majority’ to wear American flags to publicly display their patriotism. UPS drivers in Carey’s local began to spontaneously wear American flag pins or buttons on their uniforms during work hours. In response many black UPS drivers began wearing black liberation buttons on their uniforms. Management, at first, ignored the pins — until customers began to complain about them — and, then fired 20 workers for wearing various buttons. A wildcat strike began on July 28, 1970 in support of the fired drivers, and soon after Carey made the strike official. The strike lasted eleven days and the courts came down hard on the local union and its top officers, including Carey. However, in the settlement that followed, UPS rehired the fired workers and allowed American flag buttons to be worn but the question of other buttons was submitted to arbitration. Carey ended up only paying a $500 fine. However, we should remember that the most well-known political strike of that era was the notorious, racist strike in 1968 by New York City’s teachers against the black community control of schools in the Ocean Hill-Brownsville neighborhood. Led by Albert Shanker, the United Federation of Teachers (UFT), an affiliate of the American Federation of Teachers, struck for a total of thirty-six school days from May to December 1968. The ‘racist taint’ on the UFT and the American Federation of Teachers (AFT) lasted a long time, though the AFT continued to grow through the 1970s as teacher militancy was on the rise. These present struggles were foreshadowed by the Chicago teachers strike of 2012, and the less known April 1, 2016, when the union struck primarily over issues that were outside the legally sanctioned parameters of collective bargaining. To recall the 2012 strike: the Union challenged the privatization of public education through chartering, the reallocation of tax base to support privatization, and school closings in predominantly poor, Latino and African-American neighborhoods–a process the Union described as “educational apartheid” along lines of both race and class. The CTU [Chicago Teachers Union] strike was “social justice” unionism against the 1 percent. Clearly, something has changed in the U.S. working class from 2012 to 2018 with roots that go back much further. Long decried for not being as ‘political’ or engaging in type of political mass strike as European workers, U.S. workers have had a significant change in political consciousness that has led to a rise in actual struggle. It also means that for the first time since the 1940s, it is now possible to discuss recruiting large numbers of working people to socialist politics. “The beating heart of the labor movement.” That’s how the moderator of the Friday evening April 6th plenary session of the 2018 Labor Notes (LN) Conference introduced six West Virginia school teachers. The teachers were fresh from a historic victory in their unauthorized – and unexpected – strike. The same could be said about the conference itself: it represented the beating heart of American labor. 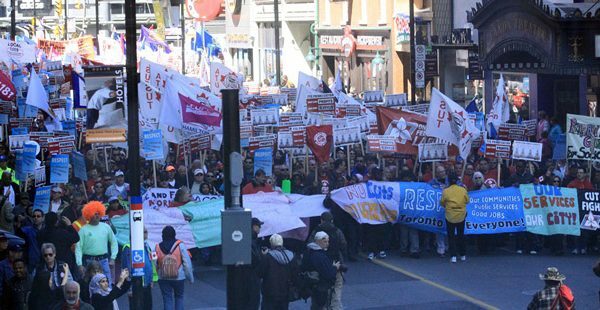 The day of strike and protest culminated with a 4pm rally of up to 20,000. As well as teachers, parents and students, and city and state workers facing cutbacks and attacks, activists from #BlackLivesMatter, an anti-deportation collective and Fight for 15 all gave stirring speeches. What made this year different, for me, was not only the happy coincidence of the conference occurring during a burgeoning teacher strike wave but its size and the political feel. LN has been growing in size since 2012, a year after the Occupy movement, with larger numbers of unions activists and young radicals attending each time. According to several DSAers, they had about 150 people at the conference. The DSA Labor Commission had a “meet-and-greet” workshop that was so packed I couldn’t get in. Other socialist groups played important roles at the Labor Notes conference. Solidarity’s members have played an important role in building the LN conferences for decades, and still do. Solidarity also has dual membership with DSA. The International Socialist Organization (ISO) had a contingent of forty to fifty members and speakers on many panels on various topics, including: healthcare, education, and logistics. The Haymarket Books table, as usual, was a center of attraction. Socialist Alternative had forty members there and speakers on several panels. Socialist Alternative’s best known member is Seattle city council member Kshama Sawant, who has recently drawn the wrath of Amazon. But it was the size of DSA and their presence and enthusiasm that made the biggest impression on me. Many of the younger DSAers are influenced by the International Socialists’ (IS) trade union perspectives of the 1970s with its emphasis on rank-and-file organizing in the workplace. This is largely due to the influence of Kim Moody. His books have shaped a younger generation of radicals on how to understand the U.S. working class and the role of socialists in the workplace. This includes Moody’s recently published Haymarket book “On New Terrain.” Moody was a former leader of the IS and Solidarity, and was also a longtime director of Labor Notes. The labor movement is critical to the struggle for socialism because 1) it is where the working class gains critical experience in class struggle through its fights against individual employers and 2) it can be turned into a tool against the capitalist system as a whole when it moves beyond demands on individual exploiters and starts to make broader demands and fight for the whole working class. Socialists should push the labor movement beyond struggles against individual employers toward class-wide fights that challenge the power of all employers. The best way to develop such a strategy is for socialists to establish and build on existing bases within the labor movement and test different tactics against the real-world constraints and contradictions of the workplace. I agree wholeheartedly. These are exciting times for socialists and workplace organizing despite the impending Janus decision. The recent strike authorization vote by UPS-Teamsters provoked a short-lived media frenzy about the possibility of the biggest industrial strike in twenty years. Just the fact that we are having such discussion is a marked change from just a few years ago. Many DSAers also want to do organizing specifically in the burgeoning non-union logistics industry best represented by Amazon’s expanding empire. Organizing in the industrial core of the economy fell off the agenda for socialists for nearly a generation — it is a good political development that it is back in discussion. All of these developments bode well for the future. The gravitational pull of DSA is quite strong on the U.S. Left right now. Besides the youth and enthusiasm of its members, the “broad tent” appeal of a socialist organization is attractive to many. DSA is involved in a wide variety of political campaigns that strike me as proto-party, including: healthcare organizing, tenants’ rights, postal banking, anti-fascist organizing, pro-Palestine, abortion rights, electoral campaigns, and defense of the undocumented. Yet, its highly decentralized structure makes extremely difficult to joint initiatives beyond local activities. What I am saying is the reborn DSA — or the next political formation that arises that will share similarities to it — provides the opportunity to create a large socialist organization, even an embryonic party in the United States. That appears to me to be a once in a lifetime opportunity. To even begin to address the enormity of crisis before revolutionaries we have to be prepared to take serious risks to break out of the political margins. Whether it is with the current DSA or another similar organization down the road, this question will not go away, but will become more pressing at each time. It is “more pressing,” I would argue, in wake of the springtime strike wave and the Labor Notes conference. Much of these gains made by U.S. socialists during the last two years are very tentative. A lot of work needs to be done to consolidate these small steps forward. This can only be done by a deeper cooperation between the groups that make up the socialist left, specifically an orientation on the unions and industries from which we can recruit the radicalizing workers. Such work has the potential to create a true militant minority. One of the most important legacies of the 1970s was failure. Despite the militant rank-and-file struggles of the 1960s and 1970s — and the creative work done by 60’s radicals who did important workplace organizing, like the IS — socialist historian and writer Mike Davis argued that they did not create a “distinct new layer of worker militants,” nor did they shift the unions towards political demands like their European counterparts. The springtime strike wave and the explosive growth of DSA demonstrate such a new layer of militants can be created; we are operating on a new terrain of class struggle. We may have our differences of opinion but I think one thing is clear: the era of building small groups is over.